A super-easy vegan dish. Feel free to switch out the veggies for whatever’s fresh at your local farmers' market. 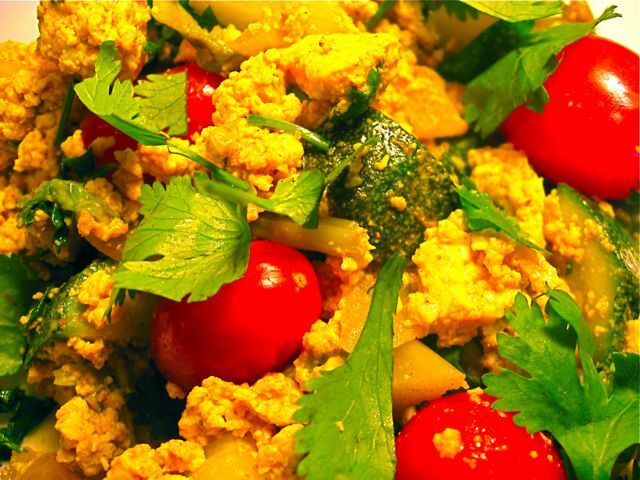 Lacto-ovo lovers may likewise swap 4 eggs for the tofu and 1/4 cup of grated cheese for the nutritional yeast, but tofu adds little fat and no cholesterol, and nutritional yeast tastes cheesily fabulous without the fat and gives you a hit of mighty vitamin B-12 besides. Open yourself up to possibility. I’m just saying. Heat the oil in a large skillet over medium heat. Add chopped onion, jalapeño, red pepper, and zucchini, if using. Continue to sauté, stirring, until vegetables soften, about 7 to 10 minutes. Stir in the cumin, turmeric, nutritional yeast, chopped tomato, and optional chopped greens. Stir together until vegetables are coated with the spices and are fragrant and golden, about 3 minutes. Crumble the tofu into the skillet. You may mash it with a wooden spoon or have a wonderfully tactile experience smooshing it with your fingers. Scramble it together in merry fashion, breaking up any odd tofu clumps. Cook until combined and heated through, another minute or so. Mix in the chopped cilantro, season with sea salt and pepper to taste, and serve. This recipe serves two people generously, three if you’re also serving rice and beans or cornbread or something additional. The recipe doubles, even triples, but is best eaten hot, fresh, and at once.